Eris Senim is a Dunmer priest added as a replacement for Uravasa Othrelas by the Knights of the Nine official plug-in. 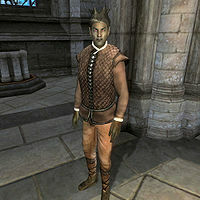 Like his predecessor, he offers basic speechcraft training and sells spells at the Great Chapel of Mara in Bravil. He sleeps in the southern room of the Chapel Hall every night between midnight and 6am, and then starts to wander around the lower area of the Chapel, randomly checking out the Chapel Hall, the Undercroft or simply standing on top of the staircase. At 8am, he will go upstairs and wander around there until midday where he will return to his routines on the lower floor. At 4pm, he will pray in front of the Altar of the Nine, before going back down to the lower levels of the Chapel. Here, he will wander around until 8pm, where he will find a chair in the Chapel Hall and eat his dinner. At 10pm, he will finish the day with yet another two hours of checking out the lower floor, before he goes to bed. He will offer his services at all times, except when he takes his dinner-break and when he is sleeping. He wears a pair of pigskin shoes, a quilted doublet, and tan linens and carries around his key to the Chapel and a small amount of gold. Eris doesn't wield any weapons, instead choosing to rely on a set of spells from the Restoration school of magic, as well as a Turn Undead spell. Eris Senim is not added to the game until the Knights of the Nine questline is completed.